Changing algorithms, new ad options, new functionalities – the constant changes in the social media landscape can be hard to stay on top of, and causes headaches for many organisations. 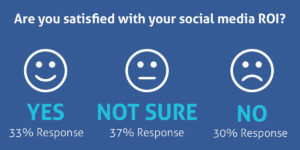 of respondents shared that managing social media channels is harder than filling out income tax paperwork. Have you considered Bespoke in-house social media training tailored to meet the requirements of your organisation? We want to help you become self-sufficient with social media. If you train with us, we’ll give you the confidence, knowledge and practical skills you need to grow. Investing in social media training now will ensure your business does not get left behind. From building a strategy to what to post and how to analyse results, this training will help you to find new clients, provide support and interact positively with existing and potential customers. We deliver in-depth courses which give you a blend of best practice, strategy, practical exercises, guides, planning, discussion and Q&A. We offer in-house training and workshops and Philippa is often engaged as a keynote speaker. Here is some of our feedback.